It's incredibly hard to believe that I've been here for almost 3 months. I'm about half-way through this incredible, life-changing experience. Whenever I think about that I have to try my hardest to appreciate all that's happened thus far and not think about the end. Still a ways to go anyway, thank goodness. A few of my friends here have been here since the end of August and I so wish that Ryerson offered a full-year program. I always thought that 5 months would be plenty, but now that I'm here I don't think it's nearly enough. Since my last post I've explored Rome, Sperlonga, Barcelona, Strasbourg, Heidelberg (much more than the first time), and Munich. From Rome we headed to Barcelona, with equally (but of course very different) as delicious food and amazingly beautiful sites to see. We were only about a 5 minute walk away from the beach, which was my favorite part. After growing up in a town on the ocean (if we can call Long Island Sound that), I've certainly missed being so close to a large body of water. After all the food I ate that week it also felt good to run along the boardwalk. Did you know the beaches in Barcelona are man-made? I didn't either, but apparently it was done mainly for the 1992 summer Olympics that were held there. Regardless, the beaches were gorgeous and it felt really good to get some sun even though I got what looked like a second-degree burn on the back of my neck during our bike tour. Both Rome and Barcelona were extremely rich in culture and I'm really happy that I got to experience both for a few days. When I returned from Barcelona, a small group from Ryerson visited Stuttgart the following week after their trip to Düsseldorf for Interpack! The first day they were here, we went a tour with them around HdM in the printing and packaging department which I had never even seen before lol. After that, we brought the group of students to Stadtmitte and showed them around the Schlossplatz and then had a really nice dinner altogether. A few came back to campus with a special invite to Club ZC (Scott's room) and attempted to bring everyone to Max Kade...although a fail, I hope our visitors still had good time in Stuttgart! The Ryerson students then went off to Mainz and Veronica came back to Stuttgart after traveling with the school was over. We went to Heidelberg, which was even more beautiful when being more aware of the world and not all-consumed with running up a mountain in the pouring rain and pitch-dark. A few beers in tow, we hung out at the castle for a few hours and enjoyed the perfect view of the Neckar. The next day, Veronica and I went to Strasbourg. I worked at a French bakery for almost 2 years in high school, owned by a couple who had just moved from Strasbourg to Connecticut in hopes of opening a successful pâtisserie/boulangerie (almost 6? years later they're still going strong). They always talked about how beautiful it was and all the customers who knew of the city said the same. It's right on the French/German border, so its culture is very interesting, being in France but also so close to Germany. We had an amazing lunch at a Bohemian restaurant in a cave-like setting, whose menu was in both French and German. We tried to use what we knew from each language but still struggled to know what we ordered. We were surprised with more cheese than any human should ever consume in one sitting but no shame here. The architecture in Strasbourg was gorgeous and the city is perfectly encircled by the river. It was an absolutely beautiful day, so we were able to sit by the river for a few hours. We also had crêpes that were unlike any crêpe I've ever eaten. They were amazing. That's probably all I should say about food in this post but no promises. This weekend we went to Munich to celebrate Antoine's 22nd birthday! We started with a lunch at a restaurant with weiß wurst, which creeped me out at first just because of the color but it was actually delicious. It didn't take me long to talk about food again lol and also had a Franconian style potato soup and a maß of Munich blonde. 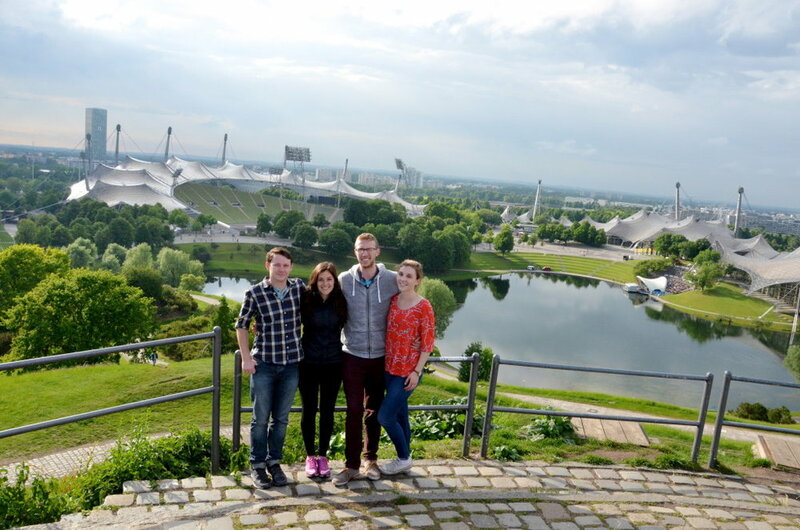 After that we went up St. Peter's church, and then headed over to Olympiapark where the 1972 summer Olympics were held. We got there just as it started to pour rain but that didn't matter being in a plastic sphere on a pond. I paid 5 euro (was supposed to 7, proud of my studenten bargaining skills) to look like a fool in a plastic sphere for 5 minutes. Completely worth it as I thoroughly enjoyed every second and even got a small bit of a workout. Last night we attempted to get a taste of Munich's extremely expensive nightlife and met some world travelers with pretty impressive lists of places they've already been in the world. Hopefully I can do the same when I graduate. Today we woke up from a decent amount of sleep and while the boys went to check out the BMW museum, Paige and I went to explore Munich's Englischer Garden. Much nature, very beautiful, many dirndls and many lederhosen. I am incredibly excited for the rest of the time I have here especially now that it's officially summer, despite still having quite a few weeks left of school and finals I guess? Not a clue when those are yet but should probably figure that out soon. I love Stuttgart and I never want to leave. "You know what the greatest tragedy is in the whole world?...It's all the people who never find out what it is they really want to do or what it is they're good at. It's all the sons who become blacksmiths because their fathers were blacksmiths. It's all the people who grow old and die without ever seeing a musical instrument, so they become bad plowmen instead. It's all the people with talents who never even find out. Maybe they are never even born in a time when it's eve possible to find out. It's all the people who never get to know what it is that they can really be. It's all the wasted chances."